Andrew was the first Apostle of Our Lord, first having been a disciple of John the Baptizer. Sometimes, for some reason, my fellow western Christians forget this and refer to Peter as the first. Peter would have died an anonymous Galilean fisherman if not for his brother, Andrew, who brought him to the Christ. One of the early successors to Peter and Paul decided to settle the question of when the church year should begin by determining that the first Sunday of Advent, and therefore the first Sunday of the ecclesiastical year, should be that Sunday nearest the feast of the first Apostle. Before that, advent was celebrated in local churches as anywhere from three days to six weeks. My patron and namesake is also patron of Greece, Russia, Scotland, and Romania, as well as the apostolic founder and patron of the Holy See of Constantinople and the Ecumenical Patriarchate. 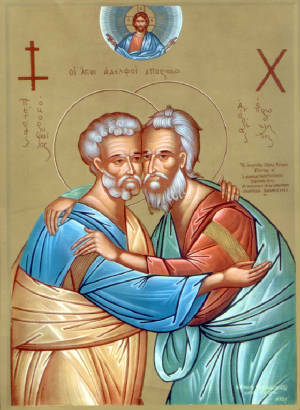 One of my favorite icons is of the brothers Andrew and Peter embracing. This Icon of the Holy Brother Apostles was written for the 1964 meeting of Patriarch Athenagoras I and Pope Paul VI, a gift from the Successor of Andrew to the Successor of Peter, as a sign of the fraternal relationship of the two churches (also called “sister churches”). A copy of this icon was given to me for my service on the National Planning Committee of the NWCU by then-chairman Allen Johnson. 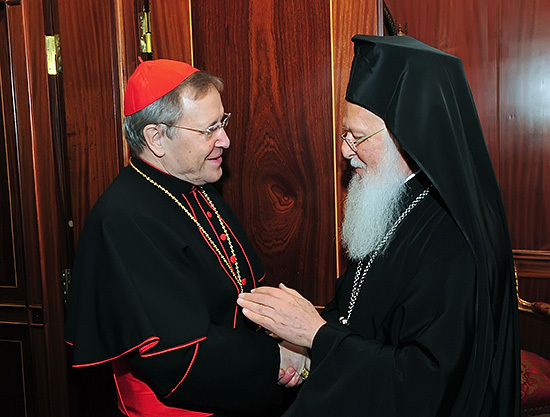 While much of the western ecumenical world was caught up in the announcement by the Congregation for the Doctrine of the Faith about the Anglican-Catholic personal Ordinariates in October, Cardinal Kasper joined Metropolitan Zizioulas and other representatives of the Catholic and Orthodox Churches on Cyprus for the 11th plenary round of the Joint International Commission for Theological Dialogue. The topic of this round of conversation is “The Role of the Bishop of Rome in the Communion of the Church in the First Millennium”. In honor of the feast of Andrew, the Holy Father sends a personal message and a high-ranking delegation to the Patriarch of Constantinople; a return delegation is sent to the See of Rome to honor the patronal feast of Sts. Peter and Paul every June 29. This year’s address indicated signs of hope for the ongoing dialogue and the central questions to our restored unity – the role and relationship of the universal primacy of Rome and the other major Patriarchates, and the local churches. The Holy Father’s message to Patriarch Bartholomew for the feast of St. Andrew today highlighted this work as a sign of the growing unity of the churches, and acknowledged the many areas for cooperation even as we are still on the journey to full unity. Patriarch Bartholomew’s message of welcome to the Roman delegation likewise highlighted the work of the Commission, now tackling some of the most fundamental ecclesiological issues which remain to divide us, namely, primacy in general and that of Rome in particular. He also called attention to the slow progress being made toward the calling of a Great Council of the entire Orthodox world, an event which has not happened in centuries, and which would be akin to an Orthodox Vatican II. By A.J. Boyd in Theology and Ecumenism on November 30, 2009 . Even though my name is Andrea, I do not think we can call St. Andrew “the first Apostle”. We can call him “the first called”, as the greek adjective (protoclete) indicates. I admit a little facetiousness in my comment “for some reason”, but when most people say “first apostle” in English they are thinking chronologically rather than in terms of honor or station.